Groups from 16 countries from all over the world have so far let us know they will be joining: Argentina, Brazil, Canada, Chile, Colombia, France, Germany, India, Malaysia, Mexico, Netherlands, Norway, Palestine, Spanish state, Thailand, USA. Some of the highlights so far include a #WorldwithoutWalls two day festival in Buenos Aires; a conference ‘Investing in Sanctuary: Freedom to Stay, Freedom to Move, Freedom to Return’ in the Bay Area (USA) to talk about border walls across the globe, decry wall profiteers, and celebrate international resistance; a photo exhibit in Berlin on past and present Walls, events within the framework of the World Social Forum on Migrations in Mexico and many more. This is the time to join the global mobilization for a #WorldwithoutWalls! For the full call, please see here. Let’s work together to build a Palestine solidarity movement that joins hands with other struggles because together we can overcome the Wall s.
Organize seminars, conferences or other events that talk about Israel’s apartheid Wall and the Walls in our societies and borders. You may want to invite speakers that connect Palestine solidarity and other struggles against the myriad of ever more killing and repressive walls that harm far too many lives and livelihoods. Organize an exhibit with photographs of the Wall(s) or other visual testimonies. You may want to stage a performance with a mock wall, distribute leaflets, have a stall in a central place or organize a full scale protest targeting one of the Wall-builders, whether a corporation profiting from the Walls or those institutions taking the decision to build a wall. We want to hear and share your ideas and struggles for a #WorldwithoutWalls. A joint statement for a #WorldwithoutWalls released on the occasion of November 9 with movements, organizations, personalities that see the connection between their struggle and the Palestinian cause in a global convergence for a #WorldwithoutWalls can be a powerful contribution to the effort. It will help you to build new conversations and for all of us to understand new perspectives. 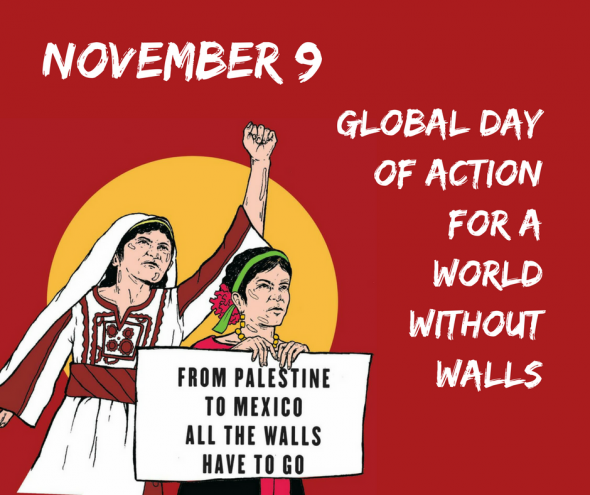 Just as last year, we will again make November 9 a day of global sharing of our struggles and commitments for a #WorldwithoutWalls. With your contributions we will once again share ideas, experiences, struggles, events, poetry, arts for a #WorldwithoutWalls in order to learn from each other, inspire each other and give each other strength.